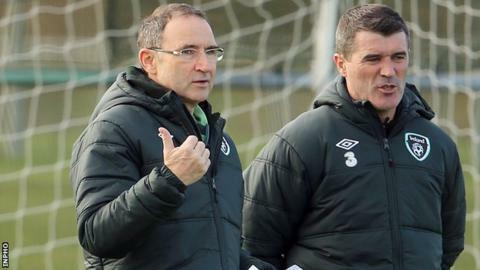 Roy Keane said the opportunity to work alongside Martin O'Neill was "too good to turn down" as he explained his decision to accept the Republic of Ireland's assistant manager's post. Keane, 42, said he had always regarded O'Neill as the kind of manager he could work under. "I'm not on a big ego trip where I feel I have to be the boss," said Keane. "Absolutely, his presence was 100% a factor. I would have been crazy to have turned down the job." Keane added that O'Neill's decision to bring him into the new Republic set-up "shows how strong Martin is". "People might see me as a threat or some sort of trouble maker," added the former Manchester United star, who infamously was sent home from the Republic of Ireland squad prior to the 2002 World Cup. "Martin will have to ultimately pick the team and pick the tactics but hopefully he will take my opinions on board." Keane insisted that his negotiations with Football Association of Ireland chief executive John Delaney in advance of accepting the role had been "straightforward" despite his previous trenchant criticism of the Irish official. "I'm going to disappoint you, it was straightforward. The past is the past. It's about working with Martin and the team," added a composed and good-humoured Keane at his first news conference since accepting the Republic role. When it was put to him that O'Neill had described his new assistant as the "bad, bad cop", Keane joked that the new manager "makes me look like Mother Teresa". A smiling Keane also responded to suggestions that O'Neill would have to tame him by saying: "I'm not some kind of wild animal." And he jocularly referenced his infamous 2002 World Cup row in Saipan with then Republic manager Mick McCarthy by praising the squad's current facilities. "The hotel's been great, the food has been lovely, the training ground is lovely - no potholes, we've footballs, there's even bibs. Major progress. "I'm not here to try and change anyone's opinions about me. "I spent years trying to please everybody and it's a waste of time and energy. You've just got to do what you think is right and get on with it." Keane insisted that he had "absolutely no doubts" about taking on the role. "I'm here to help. It's not a massive change for me not being the manager because I've only short experience as a manager. "I've been used to answering to people when I was a player." The new Republic assistant also brushed aside suggestions that his fearsome reputation could affect the Irish players. "A lot of young players here won't have hang-ups about the past. "If I had any issues or any doubts, trust me, I wouldn't be sitting here. "I've got massive respect for Martin. We're certainly not buddies, but hopefully we'll work well together." O'Neill and Keane will be in the dugout for the first time in Friday's friendly against Latvia at the Aviva Stadium in Dublin.